When driving down the road it is important to always avoid a car accident with an authorized emergency vehicle. Sometimes this may be difficult if you do not hear an emergency vehicles sirens. While it makes sense that emergency vehicles should be able to disregard certain traffic rules, there are still limits on what an emergency vehicle can do and when they are allowed to disregard traffic rules. Washington law allows authorized motor vehicles to park and stand just about anywhere, go through stop signs and red lights, exceed speed limits and even drive in the wrong direction. 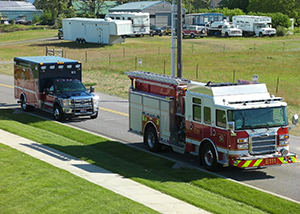 However, the law only permits this when the emergency vehicle is using the appropriate emergency lights and requires emergency vehicles to use audible warnings when necessary. No matter the reason, an emergency vehicle operator may never operate a vehicle with reckless disregard for the safety of others. The exemptions herein granted to an authorized emergency vehicle shall apply only when such vehicle is making use of visual signals meeting the requirements of RCW 46.37.190, except that: (a) An authorized emergency vehicle operated as a police vehicle need not be equipped with or display a red light visible from in front of the vehicle; (b) authorized emergency vehicles shall use audible signals when necessary to warn others of the emergency nature of the situation but in no case shall they be required to use audible signals while parked or standing. The foregoing provisions shall not relieve the driver of an authorized emergency vehicle from the duty to drive with due regard for the safety of all persons, nor shall such provisions protect the driver from the consequences of his or her reckless disregard for the safety of others. If you’ve been injured in a car accident involving an emergency vehicle, you need a personal injury lawyer in Spokane on your side. Our experienced and knowledgeable attorneys at Parke Gordon Law Firm will work hard to get you the compensation you deserve. The car accident attorneys at Parke Gordon Law Firm in Spokane are aggressive, trusted and experienced. Contact the law office of personal injury attorney Mat Parke today for a free consultation. This is your opportunity to speak with an experienced personal injury attorney about your case for free. Call (509) 482-7274 to get started on receiving a fair settlement from your personal injury case.